The True Faith must be persecuted in this world. The Savior Himself said this clearly and openly to His apostles. 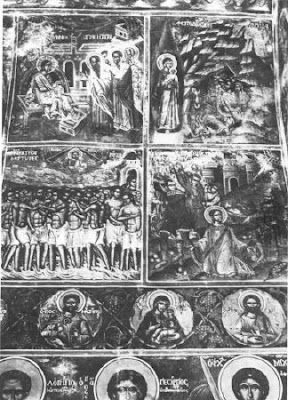 St. Apollinaris of Hierapolis in writing against the Montanist heretics says: "Let them tell us before God who, out of all their prophets, beginning with Montanus and his wives, was persecuted by the Jews and killed by the ungodly? No one. Who, from among them was taken away for of the Name of Christ and was crucified on the cross? Again, no one. Have any one of the women ever been flogged or stoned in the Jewish synagogues? Nowhere and never." However, the Orthodox saint wants to say, that the True Faith must be persecuted in this world. Heresies are generally closer to the worldly and demonic spirit, which is why the world and the demon do not persecute their own. To be constantly persecuted, with brief intervals in between, is a characteristic of the Faith and of the Orthodox Church. This persecution existed throughout all of history, either from without or within; externally from unbelievers and internally from heretics. "It is necessary for us to undergo many hardships to enter the kingdom of God" (Acts of the Apostles 14:22). "In fact, all who want to live religiously in Christ Jesus will be persecuted" (2 Timothy 3:12). The Lord Jesus prophesied this and by His example He proved it. The apostles also said this and by their examples they proved it. All the God-bearing Fathers of the Church, confessors and martyrs said this and they proved this by their example. Therefore, is there any need to doubt that, through a narrow door, one enters the kingdom of God? Should we hesitate for a moment that, "it is necessary for us to undergo many hardships to enter the kingdom of God?" No, there is no basis nor justification for doubt. Can sheep live among the wolves and not be attacked by them? Can a candle burn in the midst of cross winds and not sway back and forth? Can a good fruit-bearing tree grow along side the road and not be disturbed by passersby? Thus, the Church of pious souls cannot but be persecuted and be persecuted by heathens, by idolaters, by heretics, by apostates, from passions and vices, from sin and transgressions, from the world and by demons. So it is that not one devout soul can remain without persecution, be it externally or internally, until it is separated from the body and the world. Someone might oppose this and prove it otherwise according to his calculation and according to his logic. But, in this case, neither the mind nor the logic of one man is of any avail. Thousands who were crucified speak otherwise, thousands burned alive cry out otherwise, thousands who were beheaded prove otherwise and thousands who were drowned witness otherwise. O my brethren, the Christian Faith is mighty not only when it agrees with sensory reasoning and sensory logic but when, and especially when, it contradicts sensory reasoning and sensory logic. Those who want to live a godly-life will be persecuted. This the apostle prophesied at the beginning of the Christian era and twenty Christian centuries render a multi-voiced echo to confirm the truth of the prophecy. O Resurrected Lord, grant us light that we may be pious to the end and give us the strength to endure persecution to the end. Amen.